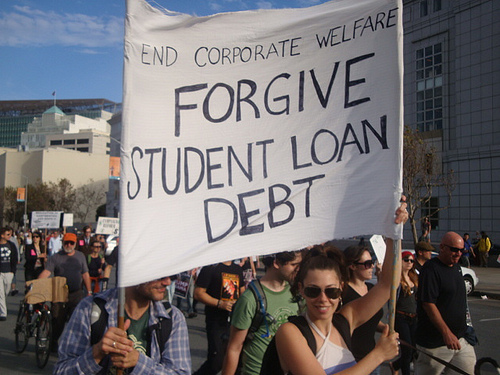 Is Occupy Student Debt pledge drive a bust? The Occupy Student Debt Campaign made a big media splash back in November when organizers urged borrowers to stop paying their student loans. Claiming safety in numbers, the organizers have urged Americans to walk away from their student loans after 1 million college loan borrowers sign the pledge. The people who dreamed up the pledge believed that if 1 million borrowers suddenly ditched their college debt obligations, it would ultimately lead to "sweeping reforms" in higher-education funding. The high-stakes pledge drive has generated strong opinions. Some believe that only a move this drastic will wake up Congress to the suffering of borrowers. Others suggest that Americans who voluntarily default on their student loans would not generate sympathy and would only create severe financial hardship for themselves. Carl Van Horn, a professor of public policy at Rutgers University, has suggested that "defaulting is considered a financial felony that will continue to haunt you. Student loans are not something you can easily walk away from, and defaulting is hardly the same thing as missing a credit-card payment. It really is a black mark." How is the student loan pledge drive faring? Three weeks have gone by since the Occupy Student Debt Campaign kicked off its provocative pledge drive. I was curious to see how successful the protest movement has been in getting borrowers to sign the student loan default pledge. I was surprised to discover how little interest there's been. According to the organization's website, only 2,436 borrowers have signed the pledge. The most petition signers have come from California (402), New York (291) and Oregon (124). It's even been a hard sell for those without skin in the game. The organization has also asked faculty to pledge their support, but only 394 professors from across the country have bothered. And "non-debtors" haven't been flocking to the cause either. Only 589 non-debtors have signed their own petition. It sure looks like the pledge drive has been a bust. Most borrowers apparently agree with the Rutgers professor and believe that student loan debt can be scary enough without flirting with default.